It’s that wonderful time of year again when the days are getting longer, the soil starts to warm up and seed catalogues pop through the door waiting for my order. March is the perfect month to begin planning your vegetable growing and preparing for the season ahead, whether you have a plot in your own garden or an allotment site. The main thing you will need for your vegetable growing area is plenty of sunshine as there aren’t many vegetables that will grow in the shade. Most soils can be worked with, and all of them have their advantages, from a light, sandy soil that warms up quickly in the spring and is easy to work, to a heavy clay which is much harder to work but does hold the water more in any dry spells. If you make the effort to get to know your soil a bit at the start and read up about what will grow well, it will be to your advantage in the longer term. The next thing to look at in the early stages is how you are going to feed the soil. Most vegetables will thrive on a plot that has plenty of well-rotted compost or manure in it, although not all plants like to grow directly into these conditions and this brings me to my next point – crop rotation. It sounds complicated but is actually very easy and essential to good organic practice in the garden. It literally means moving the plants on from one bed to the next each year (rotating them). This is done for a number of reasons. Firstly it helps produce healthier plants year on year – if you keep planting the same crop in the same location each year, the soil gets depleted of certain nutrients and the plants tend to suffer as a result. Secondly, it helps lessen the risk of soil-borne diseases like club root on cabbages and brassicas, and thirdly it allows you to use the manure or compost you put on the soil to the greatest advantage for the plants. A typical crop rotation would be as follows: for the first year in one planting area, plant potatoes – these are especially good if you are starting a new plot or allotment as they help clear the ground and break up the soil, and will be very happy with dug in manure or compost. For the second year in this plot, try roots: beetroot, carrots, parsnips, salsify etc. These will not like any fresh manure but will be happy on last year’s, which has been incorporated as you dug out the potatoes. The reason not to add fresh manure to these plants is that the carrots and parsnips tend to fork and produce strange shapes. In year three, plant brassicas like kale, cabbage, chard and swede, and then the fourth year can be called “other crops” such as beans, peas, courgettes – all these will benefit from feeding with manure or compost. I’m following a crop rotation on my vegetable plot. I have five beds as one of them is a permanent bed, containing asparagus with some strawberries along the front. If you have a large allotment or garden it is a good idea to plan at least one or more beds of permanent crops. With all the planning in place it’s now time to turn your attention to what to grow. Start with what you like to eat, and as you develop your vegetable growing keep a record of which particular crops do well. It is true that all gardeners, however experienced, have good and bad years with crops as so much is dependent on the weather and soil conditions, so don’t be disheartened if things don’t go well and do try again. In my garden the onions and garlic did very well. I grew two types of beans; the runner bean was “Painted Lady” but I’m going to try a newer variety this year called “Lady Di” as I understand it never goes stringy! 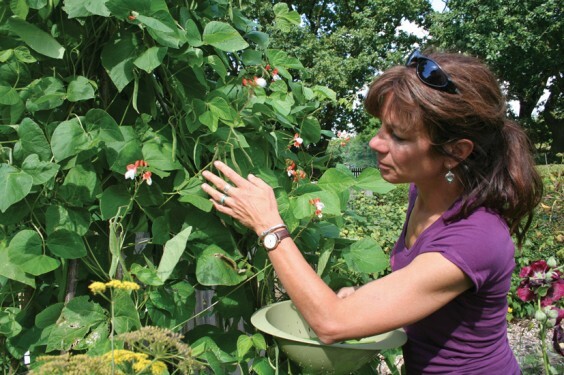 The climbing French bean I really love is “Cosse Violette”, which has purple pods, stunning pink flowers and tastes delicious. For salads I grow the salad bowl varieties as you can keep cutting them and they come back again and again; I also grow red veined sorrel and beetroot leaves to add decoration and a little flavour to the picked leaves. I am trying a few new things again this year, such as celtuce (sometimes called Chinese lettuce) grown as much for the stem as for the leaves – it can be cooked in stir fries or eaten raw. Also watercress, which I love, and a red pak choi. I’ll be keeping notes on how they grow in my soil so I’ll let you know how I get on this year.